our Uncity life: A Lovely Blog... (wha? my blog?!)... and a Giveaway Coming Soon! A Lovely Blog... (wha? my blog?!)... and a Giveaway Coming Soon! 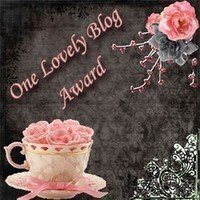 I'm just a tad behind on thanking Jan at Expressive Papers for bestowing the "One Lovely Blog" award upon my blog. There are truly so many beautiful, humorous and just downright exceptional blogs out there in bloggyland, well, I'm just honored that she thought I had a lovely blog. Jan's blog is not only lovely, but she's a talented artist in her own right. Head on over to her blog and check out her links to Etsy and Artfire-- she handcrafts gorgeous and unique paper note cards. Of course, I'm supposed to pass this award to other bloggers who are deserving... but I think I'm going to take a different approach this time. Every single blog I follow is a lovely blog, and that's no joke - else why in the world would I follow you? You know who you are... if you don't have this award yet, I want you to grab it from my post here and smack it on your blog. You are deserving, and YOU have a lovely blog! I love all of you for different reasons: many for the humor (I NEED your humor, everyday! ), some for the photos, some for the unique lives they lead or the different countries they live in, some for their recipes... and the list goes on and on. My blog wouldn't be what it is today without all of you, my readers. Even though I started my blog in March 2008, I didn't get serious about it until January 2009, and wow, I just can't believe all the wonderful people I have met through blogging. Who woulda thunk it!! I hope the future holds good things for my blog, as I think through how to segment it better, jazz up the graphics and make the content more appealing to everyone. So, hang on tight as this crazy Oz Girl decides on the next path for her "lovely" blog! Congrats on your award. Much deserved. You are lovely, my dear! Inside and out! Yea for your recognition and keep up the good work. I love you! You definitely deserved it! I am glad you are in my life! You keep getting better and better!! Indeed an especially LOVELY post, Susan! And your blog is SO deserving of this award! I have been hoarding awards for the last month. I will be releasing a spam of them when I am off from teaching for the summer!!! LOL!!! I had to snicker when you compared ohio to a big city!!! I am sure that Kansas is less populated!! But... REALLY!!! We have statues to corn!!! I live in the columbus. I hope you do not mind that I clicked follow. I usually wait to see if the blogger comes by to visit me, but I find the Ohio comment very amusing. Susan - you are just the most fun with all your cute little giveaways and nice comments. Congrats on all your awards!